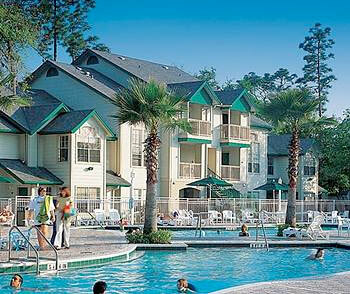 Oak Plantation in Orlando, Florida Near Disney - Bid on a 7 Night Stay in a 1 or 2 Bedroom Suite! 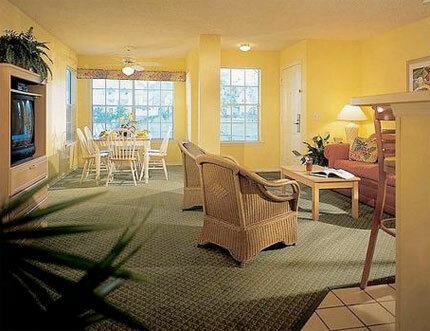 Enjoy 7 Nights in a 1 or 2 Bedroom Suite at Oak Plantation in Kissimmee, Florida! Nestled on 16 forested acres only eight miles from Walt Disney World(R), Oak Plantation offers a secluded getaway in the heart of central Florida. The resort features cozy one-bedroom villas, which surround a scenic lake with a fountain. The resort offers activities, a general store, and Internet access. Amenities include a pool complex with Tiki Bar, lighted tennis court, basketball court, games room, car-care area, fitness center, and picnic spots. Play golf close by or walk to shopping and restaurants. All adults must present a valid photo ID at check-in. washer/dryer, and a mid-week cleaning. Additional amenities include a telephone, VCR, and cable television. Your 1 Bedroom Suite will sleep up to 4 people. It has 1 bath, 1 king bed, sleep sofa and full kitchen. 2 Bedroom Suite: (maximum occupancy 8) have 2 baths, 1 king bed, 2 double beds, and a sleep sofa. The front desk is open 24 hours. The resort has gated access. Shuttle service to the theme parks is available for a fee & can be arranged through Guest Services. Resort has two levels and no elevators.